Since 1987, Vincent Clad Metals has provided custom metal cladding services. To this day, our company continues to be at forefront of cladding technology. We serve numerous industries, including the automotive, medical, jewelry, marine, medical, and military fields. Vincent Clad Metals offers composite cladding services for all alloys, and we’ve honed well-developed cladding processes over the years. The cladding process involves many steps, including cleaning, cold bonding, annealing, rolling, tension leveling and more; with a full-time metallurgist on staff and rigorous inspections from start to finish, you can be assured that the quality of our cladding services is always exceptional, every step of the way. Overlay cladding allows up to 5 dissimilar layers of material to be bonded together through cold bonding. Each layer can provide a unique benefit to the composite product, such as corrosion resistance, thermal properties, or strength. Clad metal inlays are created when one strip of metal is bonded into a groove in another type of metal or substrate. This allows pricier materials (including bronze, copper, carbon steel, and precious metals) to be located precisely where they are needed in a base metal. Our toll processing service takes excess customer matevhttps://www.vincentcladmetals.com/faqs/#1473076566113-adc59d5a-10a5rials (such as aluminum, copper, and various brasses) and turns them into a valuable product through precision slitting, rolling, annealing, and tension leveling. Increase your own productivity and cut down on costs by having Vincent Clad Metals provide the machinery and labor for your toll processing. Looking to join two dissimilar metals? Electron beam welding (EBM) is the answer. This form of welding flawlessly binds two metals together, regardless of differences in melting points, conductivity, tempers, and more. EBM is a great choice for reduced material costs; it allows for continuous coils of welded strip to be created, cutting down on wasted scrap. 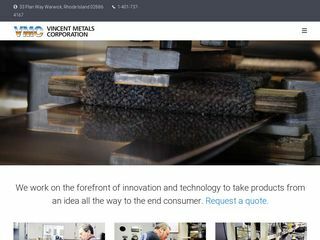 Vincent Clad Metals is ready to design a custom solution for your cladding needs. From undertaking new product research to prototyping, reverse engineering, and rigorous testing, we have the skills to create a quality and reliable product that stands the test of time. In addition to our services, we believe in delivering a stellar customer experience. We provide responsive lead times, regardless of project size; with our in-house knowledge and streamlined processes, you can generally expect a turnaround time of seven to eight weeks (excluding rush service). We also provide warehousing and next-day shipping for pre-arranged warehouse items.